Urban Terror is one of the most popular Linux multi-player first person shooter (FPS) game played by hundreds of players daily. The cross-platform game that runs on Windows and Mac as well comes with many multiplayer game modes like team survivor, team deathmatch, capture the flag, capture and hold etc. The game is based on Quake III Arena. 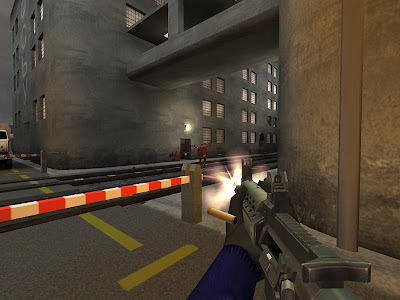 While you can play Urban Terror if you already got Quake III, it is not a necessity as the game is also based on open source version of Quake III engine ioquake3 that comes with the game. So all you need to do is grab the free game from here and lock horns with players out there. Now coming to the main part, the game has an inbuilt server browser that lets you browse for games hosted at any point of time. But the browser lacks lots of features like filtering games with multiple game modes and the interface is not so intuitive. 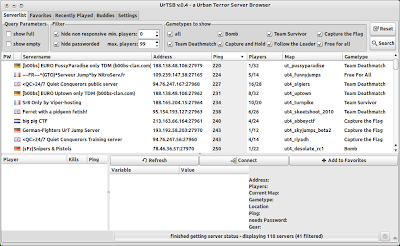 SorcererSR have made a stand alone Urban Terror Server Browser (Urtsb) that lets you search online servers and filter them by game modes with a simple interface. Download the tar archive from here and extract it. Open a terminal and CD to the directory where you extracted it. Run the following command to install it. Once the installation is finished, launch the file urtsb from the folder and go the settings tab. 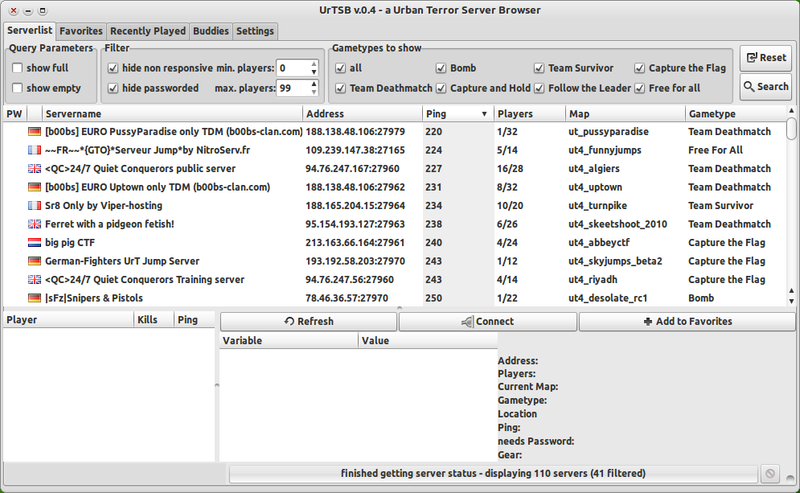 Enter the path to your Urban Terror game directory and enter a name for your Urban Terror executable file. For instance, for 32bit the name of executable is ioUrbanTerror.i386. That's it, you are all set now. Just select a server and double click on it and you will be instantly taken to a virtual world. To find more games related stuff, click on the link Games on the top of the page.